Wisconsin teachers will be trained to bring more information and a little excitement to our American history curriculum. It’s being called “Life During Wartime.” With almost a million dollars from the US Department of Education, the test project will bring historians and veterans together with more than 150 history teachers from certain Wisconsin public schools. 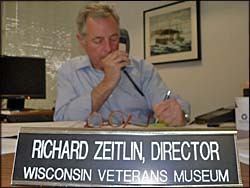 Richard Zeitlin ( pronounce ), Director of the State Veterans Museum , says school students today have a poor understanding of American History. The teacher-training program focuses on the American experience during wartime, from the Civil War to the present, both at home and abroad. Zeitlin says the Veterans Museum will provide the venue for this training and the federal grant will allow a series of experts to better explain this subject to teachers. Zeitlin has confidence this program will be successful. Wisconsin has 446,000 veterans in the state, which is a substantial part of our population and we can’t ignore that. Also, he says, the Badger State is always on the forefront of new ideas. The three-year project is set to begin in July.